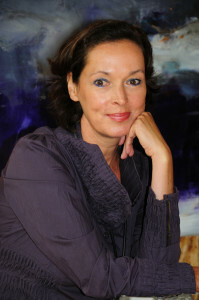 Sargam Griffin, contemporary artist, was born in Bückeburg, Germany. Traveling extensively with her family greatly influenced Sargam’s early impressions of the world. Those memorable trips included visits to the North Sea, Mount Kilimanjaro and the Great Pyramids of Giza. In 1977, she traveled alone to Africa, then spent time living in Italy, Switzerland and India. These experiences formed indelible images that are an integral part of her work, from the variations in color, to the depth of the layers and patina used on the surfaces. In 1982 Griffin moved to San Francisco where she studied at the Day Studio. This led to twenty-five years of designing and painting custom finishes for large commercial projects and private estates in California and Hawaii. A visit to Rome in 2006 shifted everything. Sargam began creating large abstract paintings on canvas and museum quality panels that possess a quality of dynamic illumination. Her garners national attention and is present in many international private collections. Current representations include galleries in New York, San Francisco Bay Area and Berlin. Sargam paints from a nearby studio situated amongst the vineyards in Northern California.